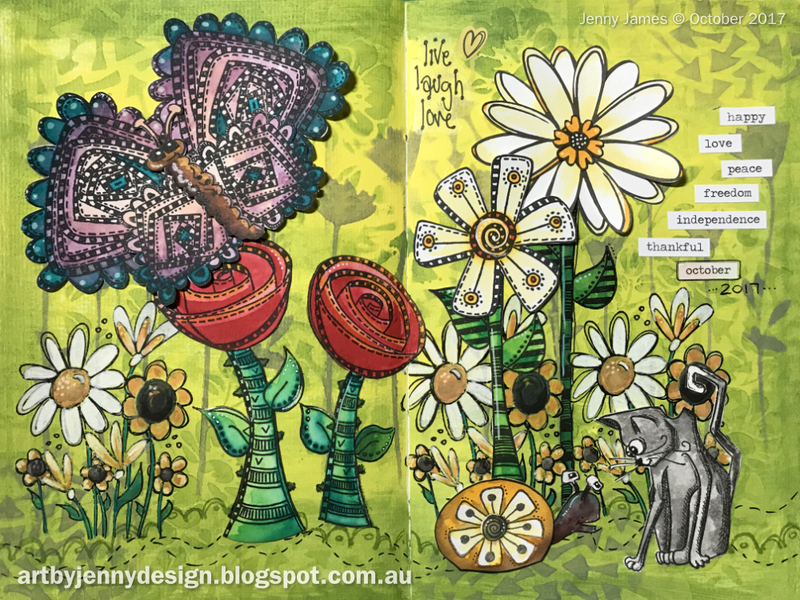 This page was created in my Jane Davenport 6x9 art journal using a few of my favourite things... watercolours, acrylic paint, stickers, stencils, die cuts, stamps and doodling. No theme, just a day playing in the studio! The page is just a bit bigger than an A4 on its side... approx 30cm x 22.5cm and is made of watercolour paper. 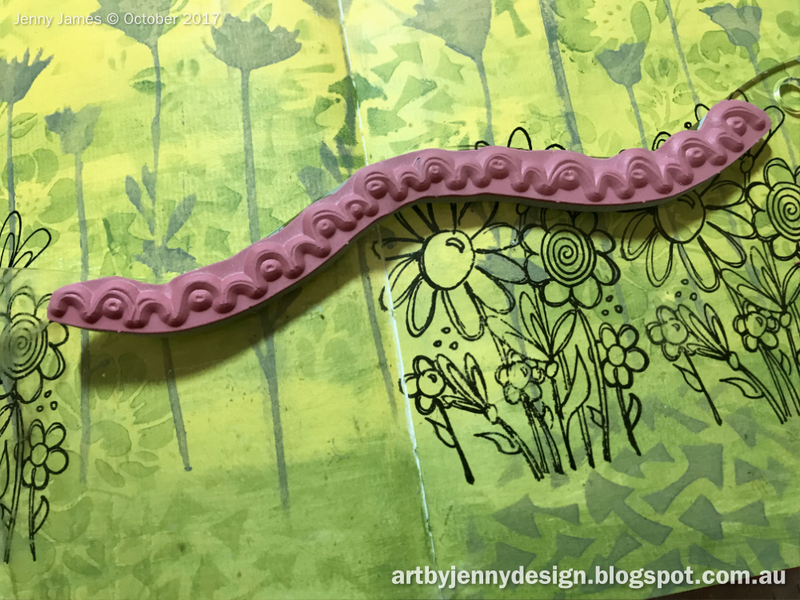 For the background I used a wet-wipe (damp paper-ish cloth, also called a baby wipe) to blend Dylusions Acrylic Paint in Lemon Zest over the whole surface. Then using the same cloth I blended Dirty Martini around the edge and a bit in the middle. Just roughly using only a smidge of paint each time (about a pea sized spot). The stencils I used were Dylusions Arrows 5x8, Tim Holtz Roses and Screwed, as well as Darkroom Door Mesh 9x12. For these initial layers I only used green and yellow paint (Dirty Martini and Lemon Zest). Less is more they say but sometimes we all just want more ... so I used Dylusions Slate Grey paint with the small Dylusions Arrows stencil and the large Darkroom Door Wildflower stencil. Next, using the wet-wipe again, I blended a bit of grey around the edge of the whole page. 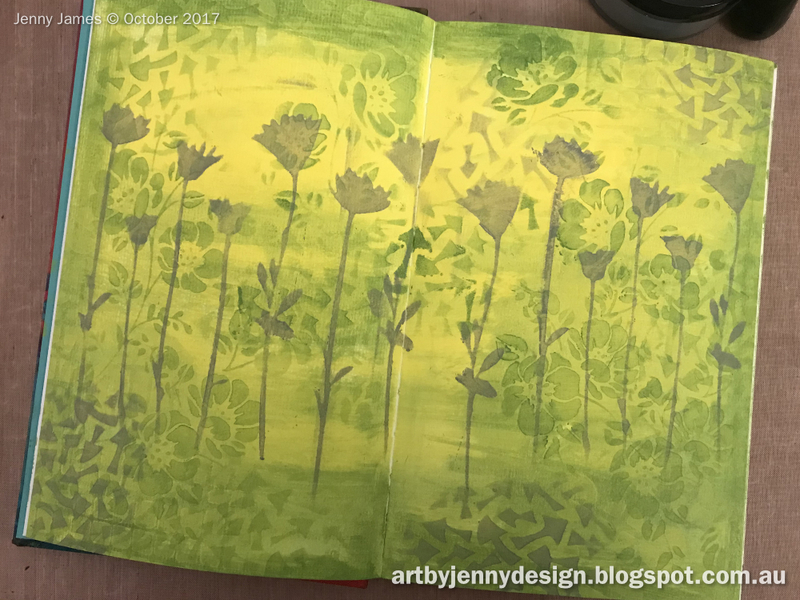 If your wet-wipe is still damp with paint, blend it over another page or surface ... using leftover bits of paint randomly like this can create the most interesting backgrounds! 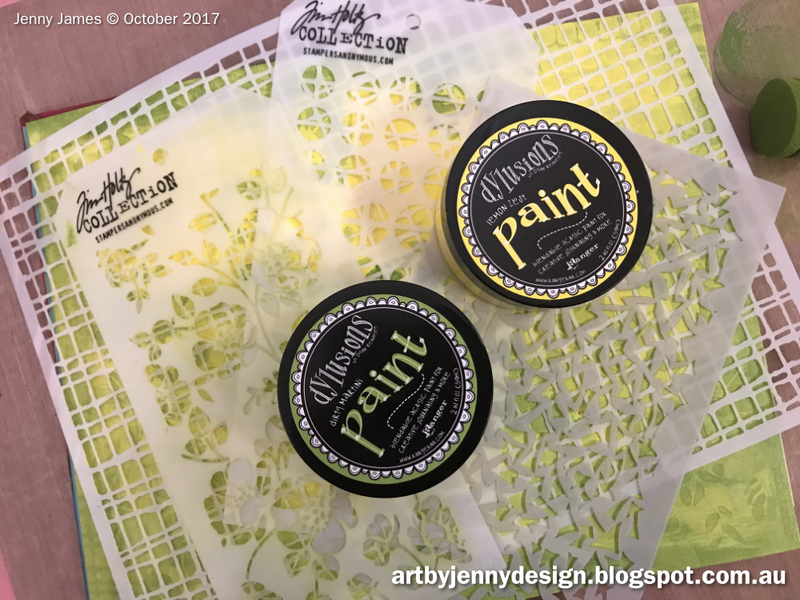 Clean off stencils the same way (wiping on a spare page). Dyan Reaveley calls them Accidental Pages :) I usually use the leftovers to make ATCs. 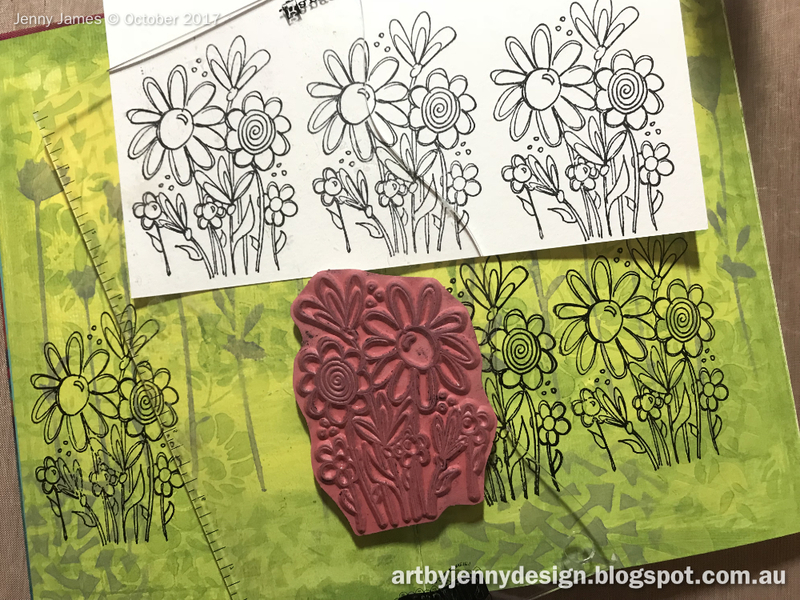 For the garden, I've used Dylusions stamp sets, Everything's Rosy and Anatomy of a Page. 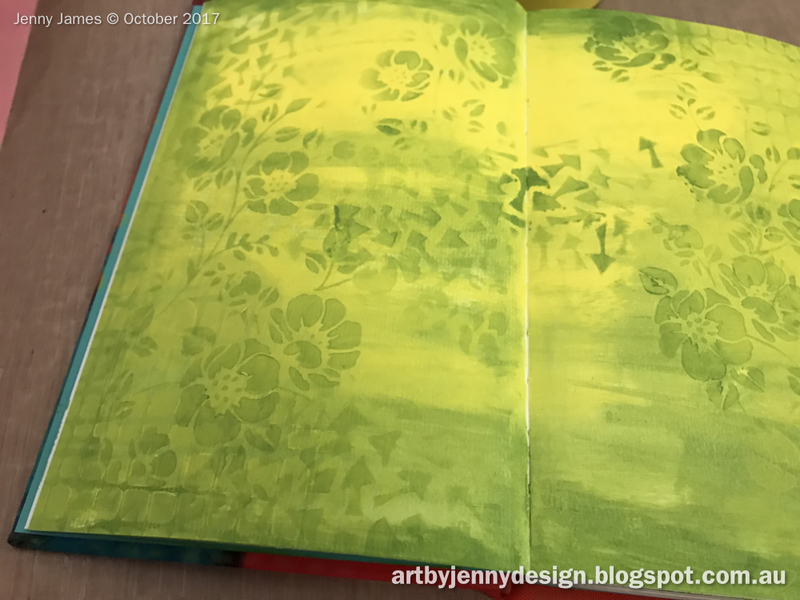 Using the black Archival ink pad from the Dylusions Creative Dyary Ink set, I stamped the flowers into the book and onto a sheet of watercolour paper. 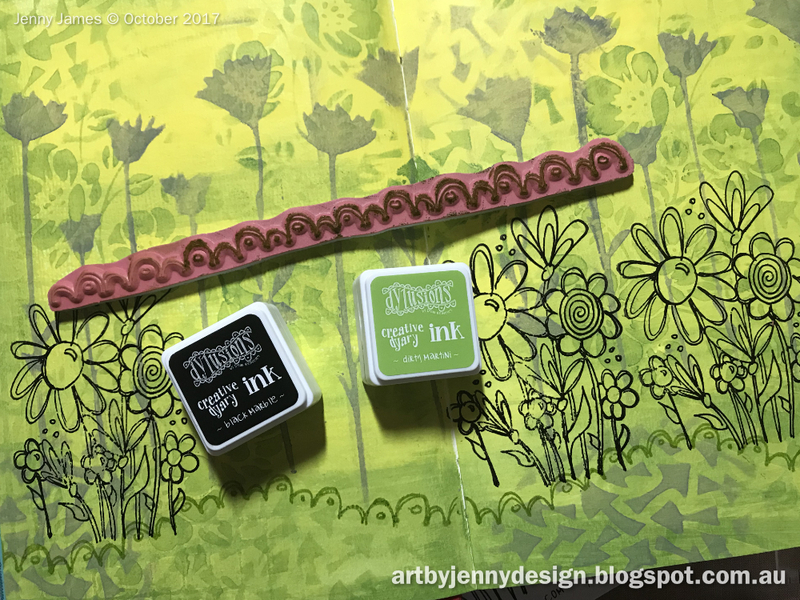 The border stamp is flexible so it can be shaped to the Dylusions Journal Block to create waves and hills on the page. I used the Dirty Martini Archival Ink Pad for this. I like how the background appears to have more colour than the 3 colours (and black) I used. Using the fine end of my Kuretake Brush Pen (brown Hikkei double ended pen below), I've drawn a wavy dashed line and a few extra bits and pieces. 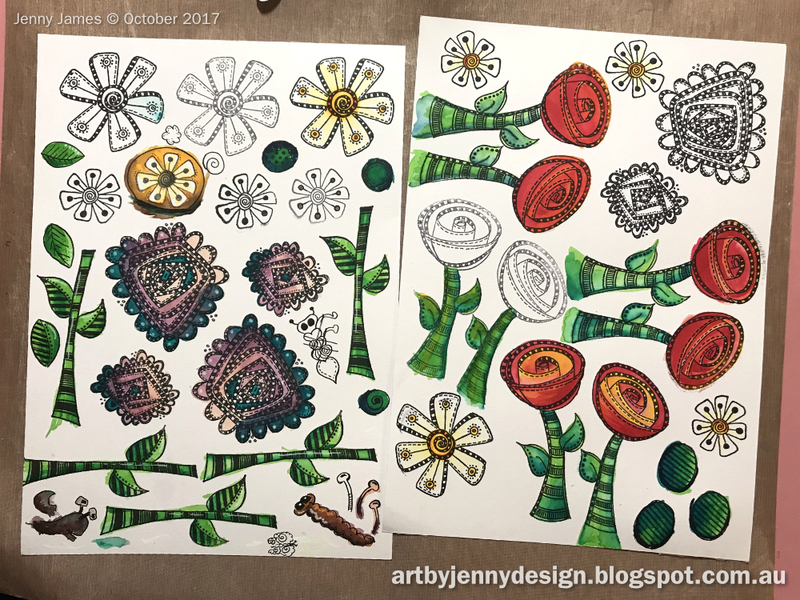 The flowers were all coloured using Jane Davenport Mermaid Markers and the Paint Over Pens (white and beach). Tip to the wise... wait until everything is dry before using the white pen... it dries alot whiter when it doesn't have to blend with damp paint! lol :) The brush nib of the Paint Over Pens are easy to clean so its no drama - just scribble a bit on scrap paper and voila, all clean. 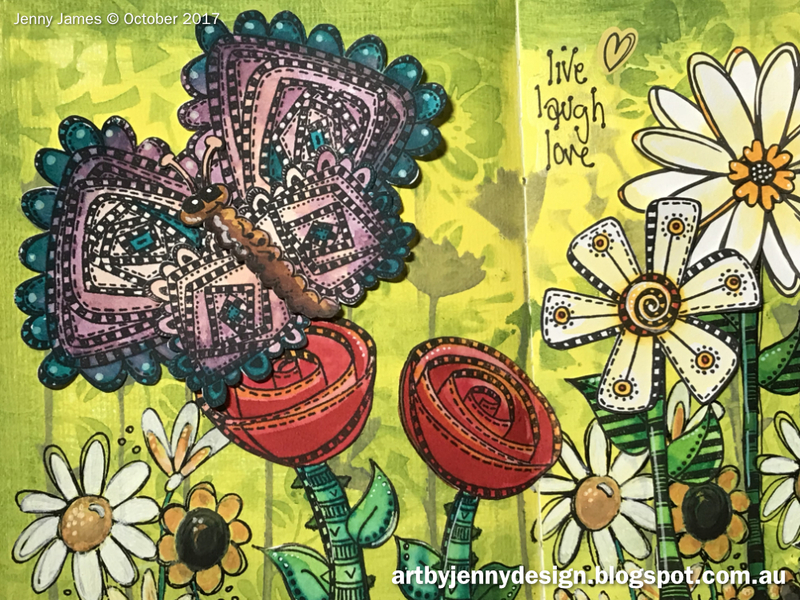 I stamped heaps of the flowers and a few of the Tim Holtz Crazy Cat onto watercolour paper then decided I needed a snail and a different butterfly body. I always draw elements a few times so I've got plenty to choose from when I colour. If this pen is too thick for your tastes, check out the Jane Davenport Inkredible Pen. It draws beautiful fine lines. 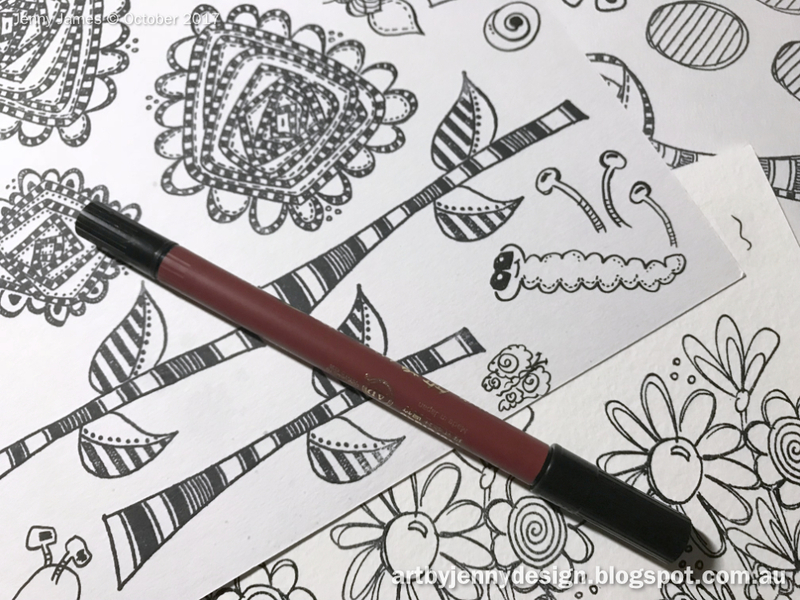 Both this Kuretake Pen and the Inkredible Pen are dye-based inks that will react to water - perfect for pen and wash drawings or adding shadows and depth. This pic above is of the Mermaid Markers - I used Lobster (red), Byron Bay (turquoise), Beach (pale peach), Pirate's Gold (golden yellow), Seaweed (green), Starfish (purple) and Reef (dark brown). I really enjoyed colouring these elements. Any pieces left over are kept for another day. 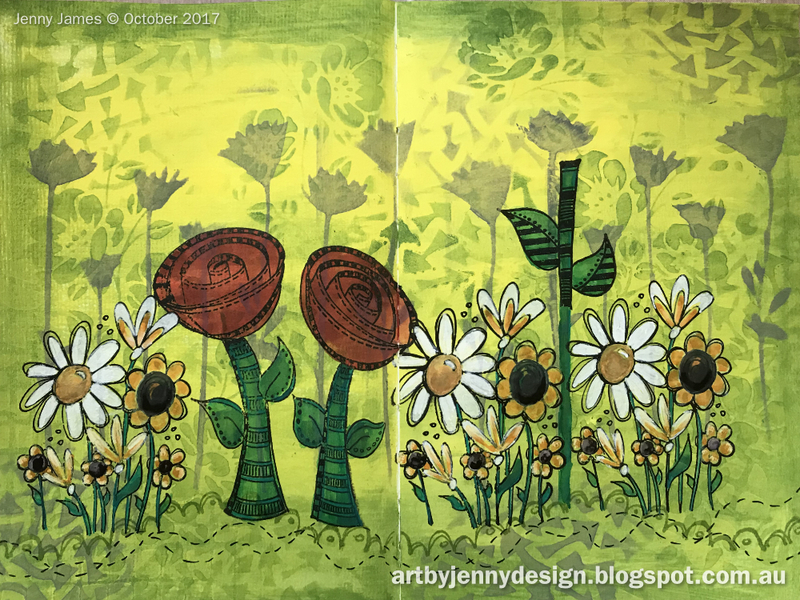 I used one of the daisies to create a snail shell, added thorns to the roses and drew a few more leaves. Everything was glued down using Glossy Accents (after trimming with scissors). They're not completely stuck down as I only added glue to the centre of each piece. I also glued the roses over the top of the ones stamped directly on the page. 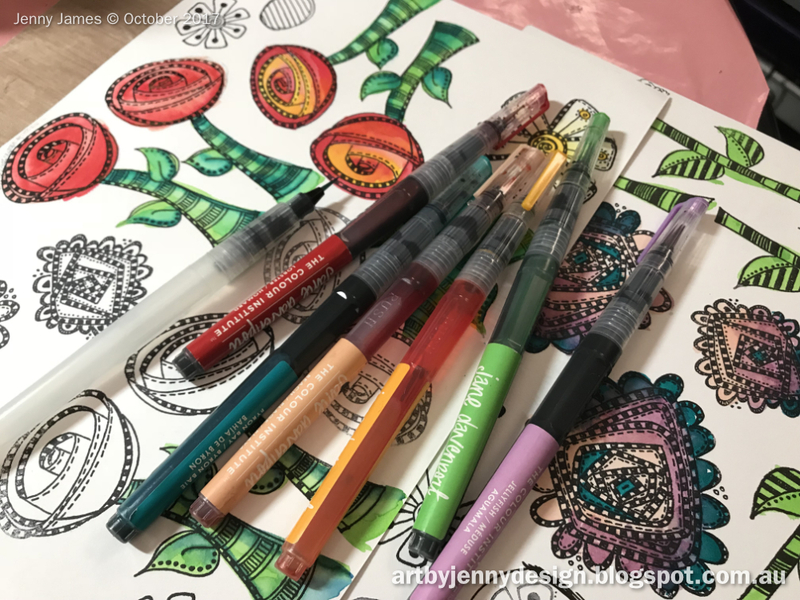 Stickers are fun to use in art journaling... 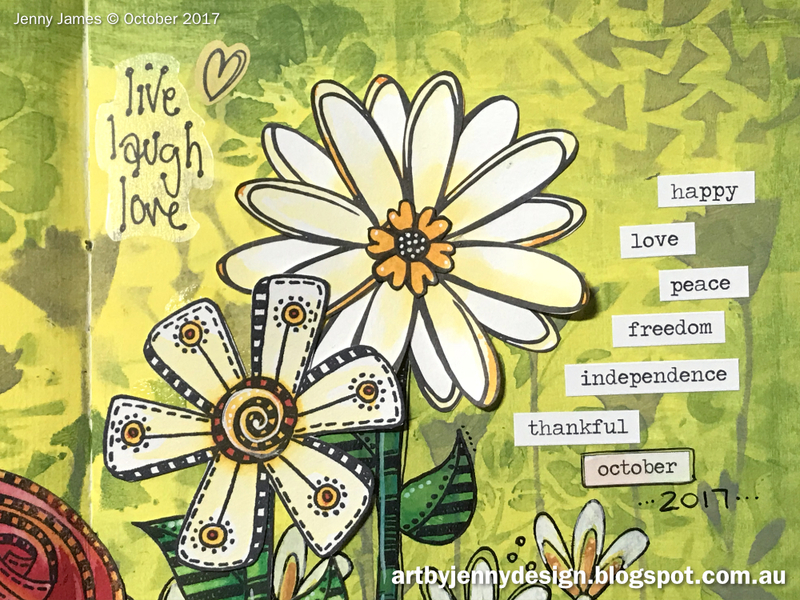 I've used "live laugh love" and the heart from the Dylusions Creative Dyary Sticker Book and the various words from Tim Holtz Chitchat spiral bound sticker book. 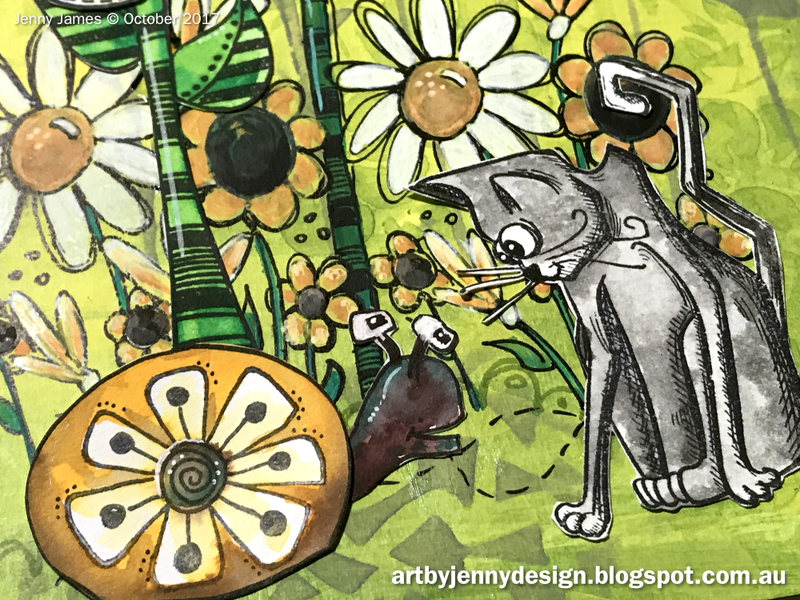 Here's the Crazy Cat with the snail.... the cat was coloured using only a wash of black watercolour paint. I used Winsor & Newton Professional Watercolour Art Sticks but any black or dark grey paint will give the same effect. You could use the new black Mermaid Marker or the Dina Wakley Scribble Sticks :) All watercolour paints are here. So that's it... my rosy garden :) Thanks so much for visiting and reading this far. I hope you enjoyed what you've seen.